JobAdder is a beautiful, easy to use recruitment platform for recruitment and staffing agencies and inhouse recruiters. Our JobAdder integration allows you to apply the Net Promoter Score framework to the candidate experience, helping you gain valuable insight into your recruitment processes. The first step when integrating AskNicely and JobAdder is to connect your accounts together. Don't worry: when you connect your accounts, we won't send any action immediately - you'll have a chance to make sure everything is ready to go before sending your first survey. 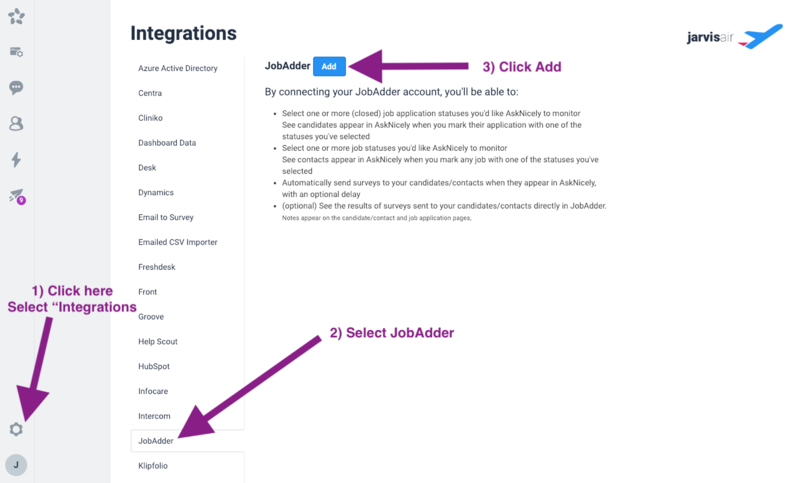 Make sure you're logged in to both your AskNicely and JobAdder accounts, then hit the 'Add' button on the integration page. Continue to click through the prompts to connect your accounts. You'll be prompted to allow AskNicely offline access to your JobAdder data (so that we can sync your data daily, even when you're not online). If everything went well, you'll end up back in AskNicely at your JobAdder Integration configuration screen. 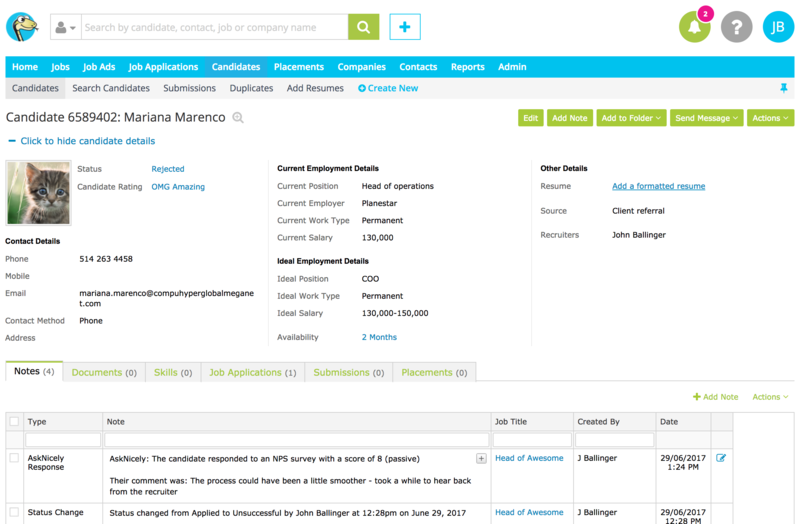 On this screen, you can see a list of job application statuses. These are configured in JobAdder, and you'll likely have your own customised list, so your list may look slightly different. We only show statuses marked as 'final' for job applications. In this configuration, none of the statuses are selected, so no candidates are synced into AskNicely. Select one or more status, and "Save Changes". This will trigger a sync to occur. AskNicely will sync candidates from JobAdder once a day, at midnight. A sync will also occur when you save changes on the integration settings page. 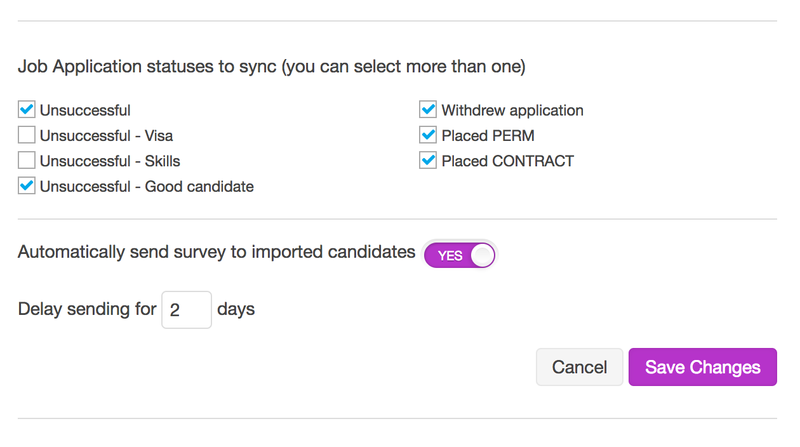 In the default configuration your normal schedule and contact rule settings will apply to candidates synced from JobAdder into AskNicely. NPS surveys will not be automatically sent to synced candidates, unless you turn on your daily schedule or conduct a manual 'blast'. You can change this by toggling the 'Automatically send survey to imported candidates' setting. When a candidate responds to your AskNicely survey, their score and any comment they leave are pushed back into JobAdder. This allows you to see valuable feedback without leaving the JobAdder application. These responses will show as a note with a type of "AskNicely Response" - you can use this to filter or search for them specifically. They will show as 'created by' the user that connected the JobAdder integration. Response notes will also be linked to both the job application and the candidate. This means you ca see all the feedback for a specific job from the notes panel on the specific job page.